Back in December 2013, an idea was formed – to engage young people in Climate Change and Energy issues. 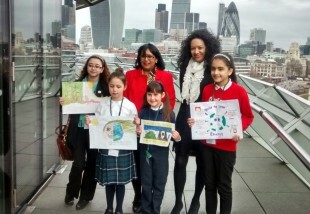 We thought the best way was to get in contact with primary and secondary schools from across London asking them to participate in a poster competition. The posters had to depict ways in which to slow down climate change or save energy. Letters were sent in the summer last year letting schools know of that the competition would be launched last September and if they would be interested in partaking. We got a good response – the culmination of which was over 50 schools sending in their entries at the end of last year. Baroness Verma, John Loughhead (Chief Scientific Adviser at DECC) and Simon Kirkland from Christian Aid judged the posters and the shortlisted finalists were contacted. The London Living Room at City Hall was the setting to announce the winners. Kanya King, Founder and CEO of the MOBO Awards, was invited to the event and gave out the prizes to the winners. It was a fantastic event and seeing the look on the children, parents and teacher’s faces when the winners were announced was worth all of the 13 months of hard work and planning. The winners (age groups 5-10 and 11-14), were awarded £1000 for their school with an individual prize of an I-pad mini. Runner ups were given £500 for their school with a £100 book token for each child. When we started on this journey, we wanted to spark the imagination of young people and get the debate going in the classroom. We hope that we have achieved this and that those debates will in turn change the way we all think about our environment.